Back in early September I had called Russ Morgan, ODFW Wolf Coordinator to inquire about why the fladry and other non-lethal protective measures had been removed from the Jacobs Ranch just a few months prior to the final predation by, and killing of, our only documented Baker County wolves. 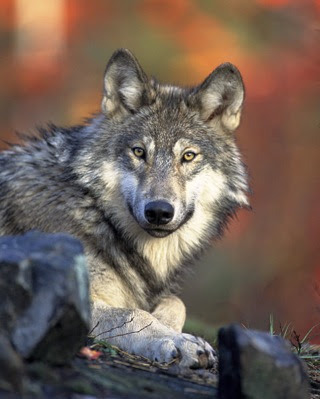 He indicated that wolves might become accustomed to the fladry and sound devices if they were to remain there permanently and that wolves seemed to be staying away from the ranch area for a long time. 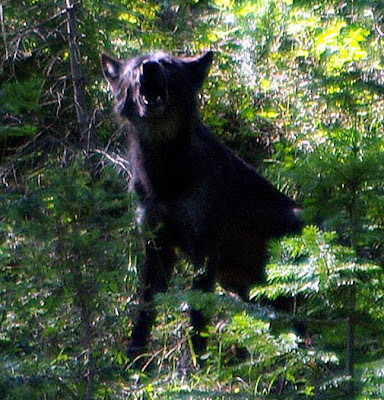 At the time he assured me that there were at least two wolf packs in Oregon, in the Wenaha Wilderness area and the Imnaha area. He also felt they would likely spread into the upper Grande Ronde watershed north and west of Anthony lakes at some time in the future. Today, ODFW released the following information which indicates the Imnaha pack is doing quite well. This story came to me from RangeNet.org at Yahoo Groups (http://www.rangenet.org/). A proposal to transfer thousands of acres of national forest in southern Oregon to the National Park Service has renewed debate over whether the Forest Service should control some of the nation's most environmentally sensitive lands. The controversy stems from a bill sponsored by two of Oregon's senior Democratic lawmakers, Sen. Ron Wyden and Rep. Peter DeFazio, that would transfer 4,070 acres from the Rogue River-Siskiyou National Forest to the adjacent Oregon Caves National Monument, managed by the Park Service. The lawmakers argue the Park Service is better equipped to maintain forest trails and campgrounds, and that the Forest Service has failed to protect the land from the effects of grazing, including the polluting of the monument's drinking water source with livestock manure. But the "Oregon Caves National Monument Boundary Act" highlights much bigger problems for the Forest Service, including years of steep budget cuts and the redistribution of tens of millions of dollars from national forest upkeep and maintenance programs to firefighting accounts. The bill also points to ongoing concerns about the Forest Service's multiuse mission, which holds that the agency must manage its holdings for timber harvesting, energy development, grazing and recreational activities while also implementing sound conservation practices across 191 million acres of public land. "I think it's both a budget issue and a question of whether a multiuse agency can effectively manage these fragile natural sources," said Ron Tipton, senior vice president for policy at the National Parks Conservation Association, or NPCA. "The Forest Service does it well in a few places, but not in many." Joseph Walsh, a spokesman at the Forest Service's headquarters in Washington, D.C., declined to comment on the legislation or the issues behind it. Rogue River-Siskiyou National Forest supervisor, Scott Conroy, also declined comment, saying it was inappropriate to discuss "pending legislation." But the Oregon Caves National Monument proposal is not the first time Congress has sought to transfer national forest land to the Park Service. Lawmakers from neighboring Washington have sought to transfer management of the Mount St. Helens National Volcanic Monument, deep within the 1.3-million-acre Gifford Pinchot National Forest, from the Forest Service to the Park Service, in part to provide the monument with direct appropriations from Congress and end the Forest Service's practice of raiding its budget to meet other priorities (Land Letter, March 26). But the Forest Service, an agency of the Agriculture Department, has shown no willingness to cede its land holdings in either state to another agency and department. In testimony this week before a House subcommittee, Forest Service officials resisted ceding control of the Rogue River-Siskiyou acreage, arguing instead for more time to develop a cooperative monument management plan with the Park Service. "We believe inter-agency cooperation would carry out the purpose of the bill to enhance the protection of the resources associated with the monument and increase public recreation opportunities through a joint public involvement and review process, to ensure that public concerns and desires are addressed," said Lenise Lago, deputy regional forester for the Forest Service's Pacific Northwest region. Steve Whitesell, NPS associate director for park planning, facilities and lands, testified at the same hearing that it could cost the agency as much as $750,000 a year to manage and maintain the additional 4,070 acres. But issues of sufficient funding and preserving sensitive lands, while central to the Forest Service's land management mandates, cannot be solved by any inter-agency agreement, said Sean Smith, policy director for the NPCA's northwest regional office in Seattle. "We're supporting this transfer proposal because we believe it's better for the resources, recreational opportunities and the regional economy," Smith said. "The benefits would outweigh any of the costs." From near the peak of Mount Elijah in the Siskiyou mountain range, Cave Creek flows downhill through the Rogue River-Siskiyou National Forest and into the Oregon Caves National Monument before eventually emptying into the Pacific Ocean. Along the way, Cave Creek provides drinking water for monument visitors, but officials say that is not at the core of the debate over which agency should manage the river and its broader watershed. Rather, the 4,000-acre section of national forest is supposed to act as a kind of buffer zone for the creek as it emerges from the mountains and winds its way toward the cave. But Park Service officials say pollution from cattle grazing on the national forest property threatens to erode water quality in the monument. To the chagrin of Park Service officials, the Forest Service granted permission to a local rancher to graze hundreds of head of cattle in the Cave Creek watershed. In exchange for the grazing allotment, the rancher is supposed to erect fences and other physical barriers to keep the cattle out of the monument property and far away from from where the creek enters the caves. "But the Forest Service has never gotten the rancher to implement that part of the agreement," said Vicki Snitzler, the monument superintendent in Cave Junction, Ore.
That raises the possibility of cow manure, dirt and other polluted runoff being deposited into the creek. By transferring the 4,000 acres to the Park Service, the government could buy back the grazing allotment, estimated to be worth about $200,000. "The main purpose of the expansion [legislation] is to draw a boundary around the watershed, to protect water in the cave as well as the drinking water for monument visitors," said Snitzler. In fact, the general management plan for the Oregon Caves National Monument, finalized in 2000, includes a stipulation that the Cave Creek land be transferred from the Forest Service to the Park Service. "We don't see that rancher as a bad guy at all. But in order to protect the stream, they need to put an end of grazing," said Smith, the NPCA's regional director. Shifting control of the Rogue River-Siskiyou National Forest property to the National Park Service also would support the findings of a recent sweeping study that recommended expanding the national park system. The report, entitled "Advancing the National Park Idea," was commissioned by the NPCA and written by a panel of distinguished luminaries, including former U.S. Sen. Howard Baker Jr., and retired Supreme Court Justice Sandra Day O'Connor. Among other things, the report notes that the Interior Department's failure to expand the 84-million-acre park system has fostered conditions whereby "familiar open landscapes are disappearing before the relentless advance of suburban sprawl and big-box commerce" (Land Letter, Sept. 24). "There's a growing sense that the NPS is not complete and that some of the areas that belong in the national park system are currently managed by either the Forest Service or the BLM," said Tipton, the NPCA policy director. Scott Streater writes from Colorado Springs, Colo.
Should private cattle graze on public lands? MADRAS — It's a battle that has ranchers pitted against environmentalists. An ongoing legal dispute over grazing practices in the Malheur National Forest has many Eastern Oregon ranchers worried about their livelihoods and the future of their ranches. Environmentalists are concerned grazing on certain parts of the public forest is degrading habitat for threatened fish. On Wednesday, ranchers from Central Oregon showed their support for their eastern counterparts at the Central Oregon Livestock Auction yard in Madras. One-by-one, as cattle entered the auction floor, their weight was registered and the announcer started the bidding. But once the animal was sold, the buyer immediately signaled he was returning the animal. And so, the bidding started again on the same animal. It was an effort to raise money for the nearly $450,000 in legal fees the group known as Five Rivers Grazing Defense has incurred while trying to hold on to grazing permits on forestland. Approximately 80 animals were donated for the fundraiser, which collected about $46,000 for the group. The auction, which included the sale of other cattle, not just those in the fundraiser, started at 9 a.m. and was scheduled to last until about 10 p.m. The dispute was sparked by a lawsuit filed by the Bend-based Oregon Natural Desert Association against the U.S. Forest Service. ONDA would like to see the Forest Service remove grazing in certain areas along Forest Service land along the John Day River, an area important for steelhead habitat. The ranchers found out the only way to have a voice in the debate was to file a lawsuit. So, they are also suing the Forest Service, whose representatives did not return calls for comment. Steelhead are listed as threatened under the federal Endangered Species Act. Brent Fenty, the executive director of ONDA, said grazing ruins riparian areas, kills cover that shades streams and keeps the water temperatures low, which fish need to survive. Fenty was quick to point out that he doesn't believe this is a precedent-setting lawsuit. But Trent Stewart, co-owner of the Central Oregon Livestock Auction in Madras, disagreed with Fenty. That's why he agreed to host the fundraiser and donate all proceeds to the Five Rivers Grazing Defense fund. He said Central Oregon ranchers are also dependent on public lands, such as in the Ochoco National Forest, for survival. “If they get started, it's not just going to happen there. Here in the West, we're dependent on public ground for grazing,” he said. Jack and Katie Johns' Fox Valley ranch has been in their family for more than 100 years. They depend on the grass in the Malheur National Forest every year to feed their cattle. Without it, they would have to cut their cattle operation in half, and they worry about what would happen in the future to their family ranch. Ken Holliday is another Five Rivers Grazing Defense rancher in Grant County. Holliday said he believes ranchers are good stewards of the land and it's in their benefit to do so. Historically, grazing has been used as a tool to manage forestland, he said. It helps prevent forest fires and helps create habitat for wildlife. Fenty doesn't disagree the lawsuit could make management tougher for ranchers. Fenty said the National Marine Fisheries Service found steelhead populations in the middle, south and upper forks of the John Day were not viable and identified grazing as degrading the water quality. The ranchers pointed to the large horse and elk populations and say they are responsible for trampling the area more than domestic cattle. Elizabeth Howard, the Portland-based lawyer representing the ranchers, said the methodology used by the National Marine Fisheries Service to measure bank damage is erroneous. “They go out and look for hoof prints along a certain area of stream,” she said. “The problem is there is no correlation of hoof prints along the stream and impact to steelhead. ... They have never connected the dots,” she said. Lauren Dake can be reached at 541-419-8074 or at ldake@bendbulletin.com. 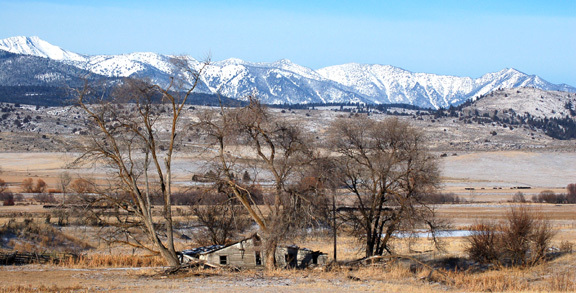 Western Watersheds Project was created in 1993 to bid for expiring grazing leases on Idaho State School Endowment Lands. The legal fight for this seemingly simple desire for open competition as required by the Idaho State Constitution has taken over 15 years, but finally, it now appears to be over. With the legal settlement described in the Associated Press story included below, the State of Idaho has thrown in the towel and accepted conservation leasing as well as fair and open competition for expiring grazing leases. The final blow to the Land Board was their legal liability under the Ku Klux Klan Act of 1871 Section 1983 that prohibits government agents from denying citizens their civil rights and equal protection under the law. BOISE, Idaho — Idaho agreed Tuesday to pay $50,000 and pledged to follow anti-discrimination rules to settle a federal lawsuit against state officials who awarded grazing leases to ranchers, not the environmentalist who had offered more money. The Idaho Board of Land has also committed to revising its rules to allow conservation groups to lease state endowment trust lands, a big change after years of fierce litigation. The board's five members are the governor, state controller, secretary of state, attorney general and superintendent of public instruction. In 2006, Washington state businessman and environmentalist Gordon Younger was the high bidder on seven Idaho grazing leases, but lost when the Board of Land with then-Gov. Jim Risch gave the leases to livestock owners. Younger, who planned to manage the lands to restore what he called "their degraded streams and wildlife habitats," sued in U.S. District Court on grounds he was the victim of discrimination. Laird Lucas, attorney for Younger's Lazy Y Ranch Ltd., said Tuesday he's optimistic this settlement and the Board of Land's revised leasing rules represent a departure from the past, when conservation groups were bullied out of winning state grazing leases and left no other option than to sue. "If someone is willing to put up money for conservation on state lands, we want them to be treated fairly," Lucas said. "This is the first time we've achieved reform in how state lands are managed." The state's new leasing rules, whose changes address more issues than just this lease dispute, await final approval in the 2010 Legislature. There, they could still face opposition from livestock-industry advocates. If the rules are rejected, Tuesday's settlement allows Younger to refile his claims against Idaho. But "if legislative ratification does occur, Lazy Y waives, forfeits and otherwise relinquishes any and all right to refile such claims," according to the pact, which also requires Board of Land members to "recognize their obligation to apply applicable statutes and rules consistent with federal or state equal protection requirements." The Idaho Constitution demands Board of Land members carefully preserve state endowment trust lands, to secure the maximum long-term financial return to benefit public schools. Ranchers have contended their industry's impact on local economies should also be taken into account, but that argument has failed to persuade judges: Western Watersheds Project, an environmental group to which Younger is a contributor, in 1999 won unanimous Idaho Supreme Court decisions rejecting grazing-lease preferences for ranchers. Clive Strong, a deputy attorney general and natural resource law specialist, said Idaho's new leasing rules will help create a level playing field for all parties interested in securing a lease - and help the state avoid costly lawsuits. "The Land Board recognized the current process was not working and was leading the way to litigation," Strong said. "It was determined to find a better process." According to Tuesday's settlement, state officials didn't acknowledge wrongdoing, but will pay $50,000 to cover the Lazy Y's litigation fees. Lazy Y, meanwhile, held open the possibility of bidding for the 10-year leases again when they become available. Jon Hanian, a spokesman for Gov. C.L. "Butch" Otter, and David Hensley, Otter's staff lawyer, didn't immediately return phone calls seeking comment. The language of the statute is much the same as it was in 1871. Interestingly, the 1874 revisions resulted in the apparently inadvertent insertion of the words "and laws," which has resulted in a large expansion of the statute's coverage. Reference to the District of Columbia and to territories was added in 1979. Section 1983 allows people to sue for state and local violations of the Constitution and federal law. It enables private citizens to affirmatively enforce these rights. Lawsuits may be brought in federal or state court, and the remedies available for violations include damages and injunctive relief. A key to Section 1983's revitalization was when the Supreme Court breathed new life into the Fourteenth Amendment. The Court developed an extensive theoretical framework for the due process and equal protection clauses, under which it recognized a wide variety of federally protected rights. Also, in Monroe v. Pape (1961), the Supreme Court interpreted Section 1983's "under color of law" requirement to cover cases in which state and local officials were not acting in accordance with state law but in violation of it. This was the beginning of a series of interpretations that loosened the judicial stranglehold on civil rights legislation that had been passed during the Reconstruction era.